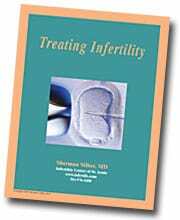 Click Here to download Treating Infertility in PDF format. With the advent of ICSI, there is now only an occasional need for donor sperm, but there is still a strong need for donor eggs. It is my hope that women who read this will learn how to plot their own biological clock, and thereby will be able to avoid having to resort to egg donation by planning their life more knowledgeably. However, an older woman who has already run out of her own supply of fertile eggs can still get pregnant (using her husband’s sperm, of course) with embryos derived from the eggs of a younger woman. Egg donation is much more readily accepted emotionally by couples than sperm donation, because the woman still gets to carry and deliver the baby. Because the woman carries the baby, emotional bonding is rarely adversely affected by its having been derived from a donor egg. Follow-up on the children who have resulted from egg donation, and on their parents, is wonderful. These are really happy families. The question, whose baby is it?, creeps into every aspect of egg donation, gestational surrogacy, and adoption controversies. Adopting eggs, i.e., using donated eggs, is much more secure for the infertile couple than struggling and traveling around the world to try to find a baby to adopt (a baby that could possibly be taken away in the future) at enormous cost. With donor eggs, which are legally recognized in every state, there is no risk (as with adoption) that the egg donor could ever interfere or lay claim to the child or to the embryos. Even a woman without a uterus can have a child. It is possible for her mother, a very close friend, or a sister, to carry her biological child for her and then give that child back to her after the delivery. This is called gestational surrogacy. It is possible to arrange legal adoption from the surrogate even before the delivery. These procedures are medically and legally extremely safe and reliable. In the mid-1980s, I saw a lovely woman who had undergone surgery by a well-meaning gynecologist for severe pelvic adhesions (scarring) caused by previous infections. The surgeon who explored her decided to try to release the adhesions on her fallopian tubes and ovaries. Unfortunately, the doctor performing the surgery got into some problems with bleeding that were beyond his ability to handle, and the only way he could solve the dilemma safely was by removing the woman’s uterus (she was only twenty-five years of age). The doctor who removed her uterus did not feel the sense of tragedy he should have, because in those days, before IVF was so routine, with those diseased tubes she could not have had children anyway. He was not aware that this woman in the future could have gotten pregnant easily with IVF without the need for the hopeless operation to open her completely cemented-down tubes and ovaries. If this woman had only known that all she needed in order to get pregnant with IVF was a uterus, she might have avoided this foolhardy operation. Miraculously, four years later, I called this woman back to tell her what, at the time, seemed absolutely incredible: that she could have a baby after all, even without her uterus. We could use her eggs and her husband’s sperm and put the fertilized embryo into her own mother’s uterus. Then, nine months later, her mother would give her newly delivered baby back to her. We now have helped so many women who have no uterus, or for whom pregnancy would be dangerous, have their babies this way. In many cases, their mother carried their baby, and in other cases, a sister, an aunt, or a close friend. Thus, a mother can give birth to her own grandchildren, and a sister can give birth to her own nieces and nephews. If you have no friend or family member who can carry your baby, we can, nonetheless, find you altruistic gestational surrogates who can do this for you.